CARACAS, Jul 22 2013 (IPS) - Microfinance is essentially social, but its expansion and evolution towards diversified financial services for those who are excluded from the conventional system has compelled it to develop new codes and practices to reinforce the message that its goal is people – particularly the poor. “Providing credit for people at the base of the social pyramid does not necessarily mean you are fulfilling a social mission. That is not enough, reality demands more,” Mario Medina, head of social assets projects for Mibanco in Peru, and one of the speakers at the forum, told IPS. That extra mile “demands good practices in every activity, from collections and client support to how employees are treated,” said Medina, whose institution is one of the best known in Latin America for its support of microbusinesses, and which grants 90 percent of its loans without collateral. “It was necessary to emphasise that social outcomes are also part of our income, a result, and that the returns are not only financial,” said Micaela McCandless, coordinator of USSPM activities for Accion, a global organisation that promotes financial inclusion based in Boston, Massachusetts. The Forum was organised by Bangente, a Venezuelan microcredit organisation that serves people whose poverty level makes them “invisible to commercial institutions and unable to enter them, but who with financial support and training are able to change their lives,” Bangente president Juan Uslar told IPS. At the Jul. 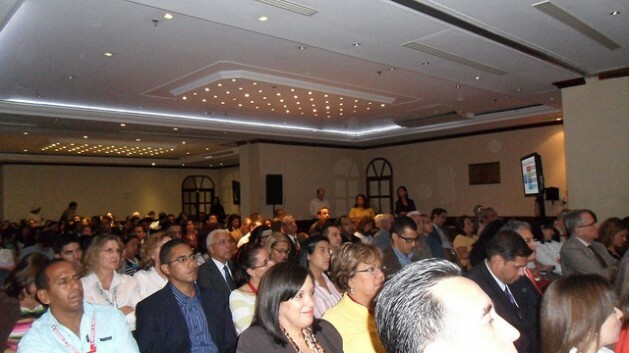 16 forum, and at later meetings between the international speakers and Venezuelan microcredit operators and clients over the next two days, the microfinance industry exchanged experiences on the introduction of the six Standards, established in 2012. The Standards were formulated by a consensus of the Social Performance Task Force (SPTF), made up of leaders of all parts of the microfinance sector: donors and multilateral or private investors, technical aid providers, national and regional operators, certification agencies, experts and beneficiaries. SPTF was created in 2005 by several international organisations, especially the World Bank’s Consultative Group to Assist the Poor (CGAP), which says 2.5 billion people lack access to affordable financial services, although they are key to overcoming poverty. The Standards build on the work of previous initiatives, like the Client Protection Principles promoted by the Smart Campaign to define, measure and certify dual social and financial results. The campaign was launched in 2009 by microfinance leaders in countries of the developing South and the industrialised North. Ninety-two percent of Génesis Empresarial’s credits and services are granted in rural areas, 67 percent of them to women and 62 percent to indigenous people, said Sagastume, who was also a speaker at the Forum. She pointed out that some microfinance institutions have evolved into formal banks, while the capital markets are now the largest financiers, replacing donors. “We who were born to eradicate poverty, improve living conditions, and generate positive changes in clients and their businesses, families and communities have always been concerned with the social return on investments. But the Standards give us clear concepts and well-defined goals, and that does a great deal to facilitate management,” she said. Moreover, “it focuses each member of the institution and its clients on the goals: for whom, and why, everything is done. The board, the human resources department, client services, the finance sector, marketing – they all line up with this focus and that helps create a convergence of efforts and purposes,” said Sagastume. In the new scenario, Medina said, recalibrating indicators on the social aspects of practices and assessments “is essential…What is not measured, is not improved, and only when you begin to measure practices and results do you open a new and wide spectrum of aspects you can improve for people’s benefit,” he said. His organisation, Mibanco, has gone even further than the assessment of dual social and financial results by incorporating “triple results” in its practices, goals, measurements, monitoring and assessments. “We include the environmental component in credits and services, for the institution as well as for the clients, because without it there can be no sustainable development,” he said. She stressed the importance of the decision to set the Standards for management practices and not for social results. “Experience shows that if an institution focuses on balancing financial and social performance, good financial and social results are achieved,” she said. She added that there were “so far no comparable data to monitor and define standards for client impact,” although she ventured a guess that in the future such universal data might exist.